You still have it, Occupy. They're still looking at you. A lot happened in Chicago over the weekend at events related to the demonstrations against NATO. Depending on where you go or who you ask, you get a different picture. It's a real kaleidoscope of images and viewing angles. I want to look at some of the kaleidoscope, then add things up. Remind you of this? It should — they're back. Per Sam Seder, there were also anecdotal reports of LRAD deployments. Chicago Police in riot gear battled with [...] protesters at Michigan and Cermak on Sunday, with officers raining down baton blows, pushing taunting protesters back and leaving some bloody. I've left this report brief (and edited) because I've read many non-mainstream accounts that conflict with those from mainstream media, whom I strongly suspect of "framing" rather than reporting. I suggest you do likewise — strongly suspect the mainstream media of "framing," not just reporting. This event, with massive turnout and tremendous energy, saw the participation of numerous groups from Chicago and the surrounding area, including students, teachers, and activists on a variety of issues ... No one can have been disappointed with the turnout, but it might have been bigger if not for the fear that was spread prior to Sunday. In the face of that fear, Sunday's action was remarkable. The fear was the result of a massive militarized police build up, rumors of evacuations, the boarding up of windows, brutal police assaults on activists, preemptive arrests, disappearances, and charges of terrorism. A segment of the activist world plays into these police tactics, wearing bandanas, shouting curses, antagonizing police, and eroding credibility for claims that violence is all police-initiated. Yet the vast majority of the crowd was disciplined, nonviolent, and effective. It is critical that the people of Afghanistan know the people of the U.S. oppose what NATO is doing to them. Agree or disagree, that was the message. 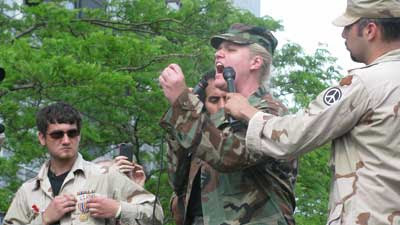 Veterans demonstrate against war in Chicago, May 21, 2012. UPDATE: More images of the soldiers' protest here. ■ About those "disappearances" you might start here. There are many more reports like that. It paints yet another picture, this time of covert police intel ops, likely infiltration, and "preventive" uncharged detentions. Were there also agents provocateurs sprinkled among the boys in black? You guess. These images sum to an establishment that's frightened and feeling under siege. They are afraid that Occupy will have an effect and are determined to stamp it out. Occupy still has their attention (thank you, spirit in the sky). The Masters of the State are determined — stupidly in my opinion — to make themselves and their cops the news; to send a message, as it were. Message sent. I was worried during the winter hiatus that Occupy would become ho-hum, last week's newspaper. The State's preoccupation (heh) means Occupy might still build critical mass. It seems clear that Occupy leaders (you know you exist) should be certain to embrace non-violence. You don't have to police your ranks (the cops will do that for you — by infiltration and by beating). But define violent attack (yes, even against property) as outside the Occupy Movement circle. I've expressed that argument here. The additional reason is infiltration. You know you will be infiltrated, Occupy. You've certainly been infiltrated already. The first mark you should put on someone espousing violence is "cop candidate". You'll be right at least part of the time, and you can't afford to be wrong, to assume the sincerity of the violent. If you divide around violence, you will shrink and ultimately fail. If you unite against violence, you retain the best PR advantage you have — "We're not the 1%. We're not Them." In my opinion, this is your most promising growth path. And your success matters. As I wrote earlier, the whole rest of the resistance, of which Occupy is just a part, needs you to grow. Critical mass.